Welcome to Saskatchewan is A Thing, my compilation of all of the random references to Saskatchewan (Saskatchereferences), which I believe is over-represented when it comes to random references, chasing some of the greats like Timbuktu and Tripoli. If you know of a Saskatchereference that I haven't featured yet, please leave a comment! It seems like ages since I reviewed On the Road, and that's because it has been ages, or rather two and a half years or so. It would be nice if I could actually get this sort of thing done in a timely manner. 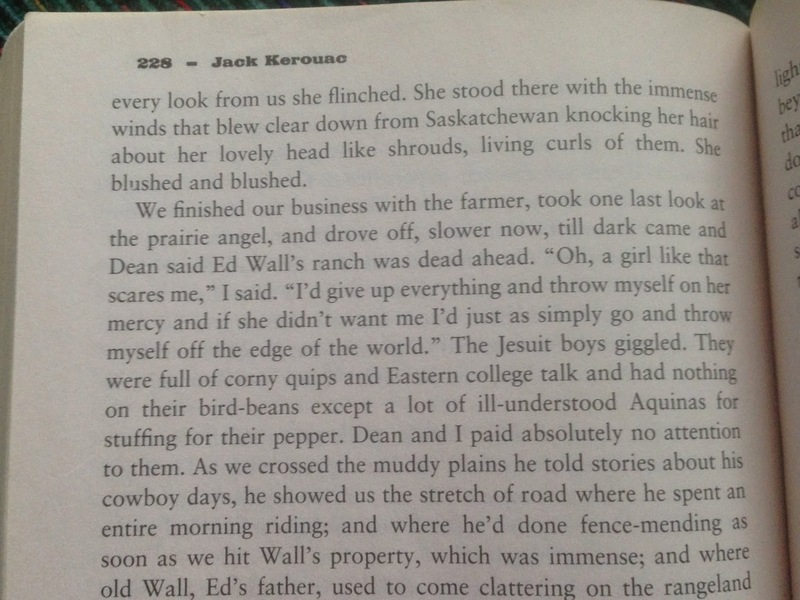 I didn't care for the novel and haven't thought about it much since, but it did have a Saskatchereference in it, and that can't be overlooked. As per usual, it has to do with the wind. She was about sixteen, and had Plains complexion like wild roses, and the bluest eyes, the most lovely hair, and the modesty and quickness of a wild antelope. At every look from us she flinched. She stood there in the immense winds that blew clear down from Saskatchewan knocking her hair about her lovely head like shrouds, living curls of them. She blushed and blushed.